Over the weekend my daughter and I made some cool cake pops to celebrate the start of Springtime. We had a blast going through all the stages together, even though she really wanted them to be done quickly. We decided to top them with really cute sprinkles for an added Springtime touch. We also flavored them with a little bit of peppermint oil for a fun peppermint taste! And these bite sized portions can easily be used as a snack or dessert. 1. Crumble the baked cake, icing or cream cheese, and peppermint oil into a large mixing bowl and stir together until it turns into a playdoh like consistency. 2. Form the dough into golf ball size balls and place on a line cookie sheet. Chill the bowls in the fridge for at least six hours. 3. Melt the chocolate in the microwave. 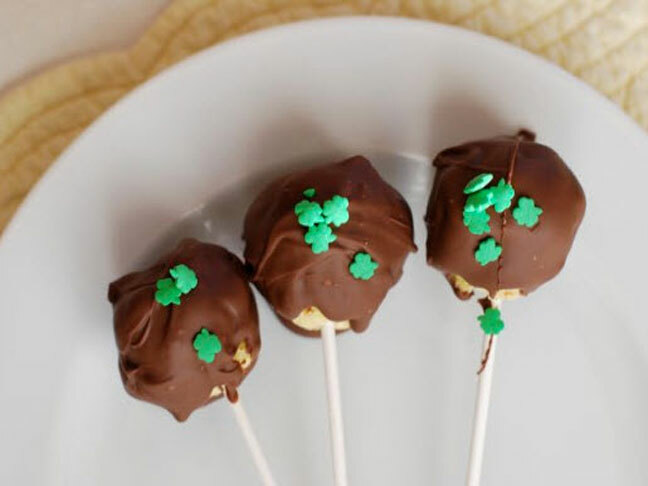 Place the balls on a lollipop stick and dip them in the melted chocolate. Decorate with sprinkles if you’d like. Return to lined sheet and chill for another two hours. enjoy!